The Concord grape was developed in 1849 by Ephraim Wales Bull in Concord, Massachusetts. The pollen parent is unknown. Although Concord is frequently considered to be basically a Vitis labrusca cultivar, some have argued that the hermaphrodite flowers suggest at least a small amount of Vitis vinifera in its pedigree. This trait has not been proven to exist in any native American grapes. However, Concord is definitely much more labrusca-like in its characteristics than vinifera-like. Some consider the likely male parent to have been Catawba. 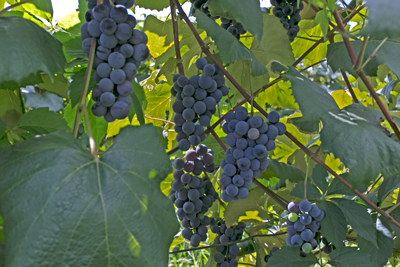 Concord grape juice is used for making grape jelly traditionally used in the peanut butter and jelly sandwich. Wines from these grapes is usually fruity and robust with foxy and jammy character. Typically used in a sweet “Lambrusco” style.